Network Rail has unveiled plans to build a new £26m station on Corporation Street in Rochester, UK, as part of its aim to increase capacity and provide better facilities for passengers in Medway and Kent. The new station, which is part of a wider £135m Network Rail investment programme in Kent’s railway system to meet growing passenger demand, will be built 500m up the line, replacing the current 121-year-old Victorian station, which cannot accommodate longer trains. The £135m east Kent re-signalling project will see the extension of platforms at Strood station and the addition of a new platform at Rainham station, as well as the renewal of signalling equipment between Longfield and Sittingbourne and Beltring and Strood. The project will also upgrade seven level crossings and reduce journey times between Rochester and Meopham. Network Rail is due to submit a formal planning application for the new Rochester station to Medway Council by the end of spring 2013. Scheduled to be completed in winter 2015, the new Rochester station will feature three platforms that will accommodate trains with up to 12 carriages. "Network Rail is due to submit a formal planning application for the new Rochester station to Medway Council by the end of spring 2013." Following completion, the new station will be operated by Southeastern; plans include step-free access to all platforms and improved station car parking. Network Rail’s route managing director for Kent, Fiona Taylor, said that the proposed station will provide passengers with improved facilities and give better access to Rochester and Medway, as well as the to the town centre and surrounding area. "The new station will be able to accommodate longer trains than the current station, helping to boost capacity and providing more seats for passengers," Taylor said. "An integrated transport hub will provide better links to other types of public transport." Medway Council leader and regeneration lead Councillor Rodney Chambers said: "If this proposal gets the go ahead it will lead to a new, better train station for Rochester, which will result in a quicker, more reliable service with more space for passengers." 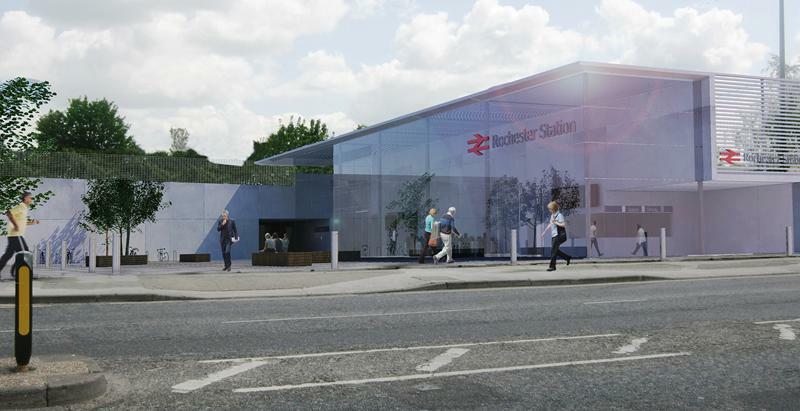 Image: The new £26m Rochester railway station is scheduled to open in winter 2015. Image: courtesy of Network Rail.